LanguageDesk enables customers to easily track the progress of their projects from start to finish by providing a centralized overview of all translation and localization projects, their status, associated files, costs and communication history. What’s more, it’s absolutely free to use for all Milengo clients. Scheduled delivery dates and the current status of your projects, including an individual breakdown of progress by file or language, can be accessed at a glance, 24 hours a day. LanguageDesk’s team dashboard enables colleagues to share responsibility for managing translation and localization within their organization regardless of who initiated the initial request. 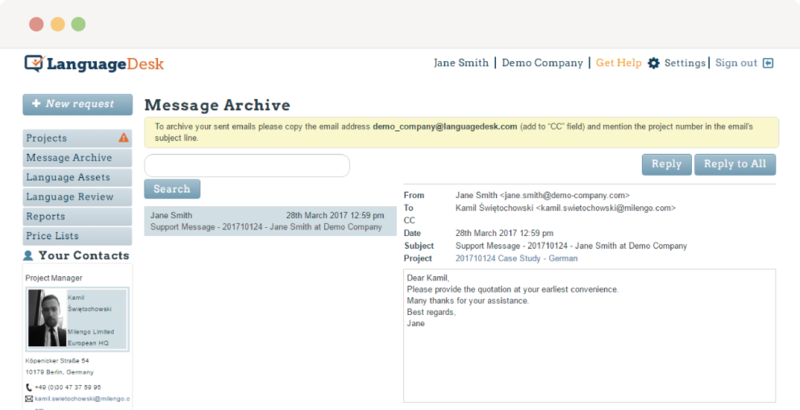 No more chasing emails or phone calls, with LanguageDesk all your project messages and notifications are stored in one place in a secure, searchable database. You can send and receive messages from within each project, which are saved so that you and your team members can quickly retrieve communication history along with a full online repository of completed projects and associated files. Most ongoing translation and localization efforts share a common set of assets such as translation memory databases, glossaries, term bases, style guides and branding guidelines. LanguageDesk includes secure, built-in asset management to ensure everyone working on your projects has access to the latest, most up-to-date versions. 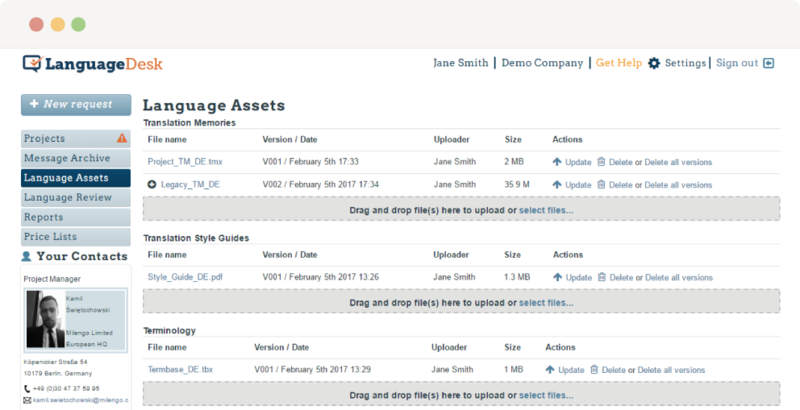 With LanguageDesk’s asset management feature, you can easily keep track of when your language assets were last updated and by whom. No more digging in your inbox to find a particular file version. Instead, everything is stored online for you and your colleagues to access and share with the Milengo team. LanguageDesk manages the review and approval process by giving client-side reviewers access to a customized dashboard where they can easily see files allocated to them for review, prioritize the tasks assigned to them and submit feedback or change requests. Whether you are managing complex software localization projects that need to be validated by an engineer before accepting delivery of the translations or coordinate pan-regional marketing campaigns and would like colleagues in the regions to review the translations before publication in the local market, LanguageDesk’s Review Dashboard gives you a simple way to integrate these parties into the workflow. Without having to keep track of rounds of feedback or chase for approval in email. Allocated reviewers retrieve files from one place at any time, even when working remotely, and as a project owner you can see the progress of the approval stage at any time. 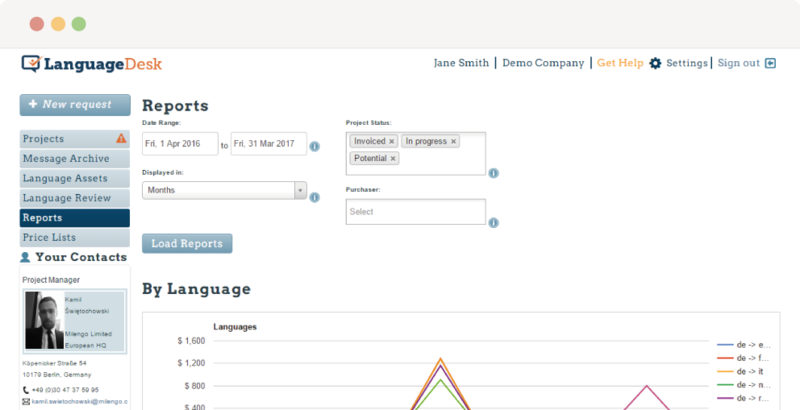 LanguageDesk’s reports module allows you to gain useful insights into the financial aspects of your projects. 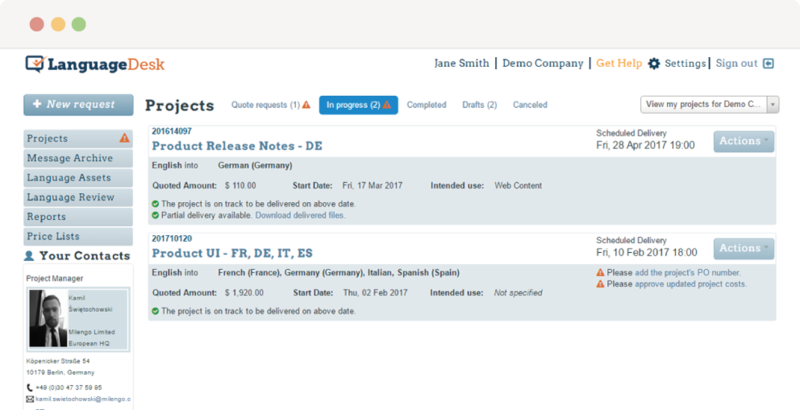 Reports can be easily generated according to project status to give a clear, visual breakdown of translation spend over a defined time period. 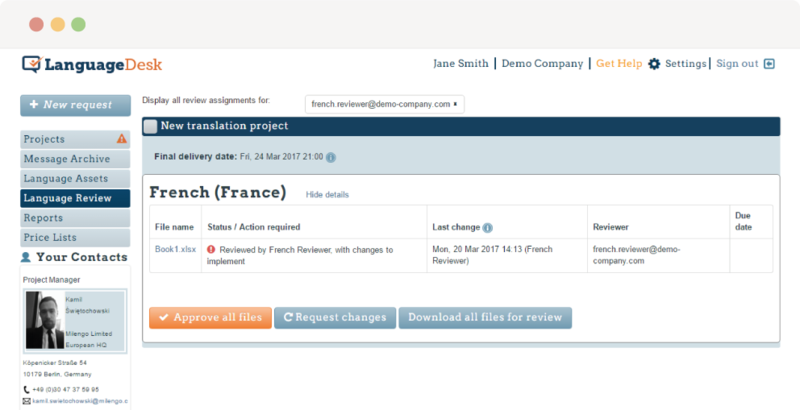 The reports feature is extremely useful for tracking the performance of language assets, such as translation memories, where spend can be seen to decrease over time as more and more translations are completed.